Acadian Genealogy Homepage; Acadian Surnames (Nadeau to Quirion)! 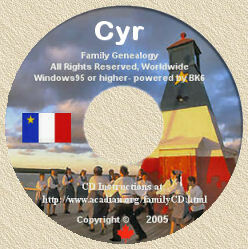 "Acadian-Cajun Family Trees; ©1999 to cmainFrameurrent date"
Note: I've only included those surnames which appear a minimum of 41 times on the CD's. Note: I've only included those surnames which appear a minimum of 28 times on the CD's.